Chickens Can’t Fly from Amused Sloth and a few other older Xbox Live games on Windows Phone suddenly vanished from the Windows Phone Store recently. Now our good friends at Amused Sloth has shed light on the situation. Xbox Live games that were published by Microsoft Studios and still used MS Points for in-app purchases were pulled off the store by MS.
Microsoft Studios is. And for the limited number of games that were affected, the official decision was to no longer support them, but allow the developers to re-release the games as we see fit. The good news is however that Chickens Can’t Fly is back on the Windows Phone Store as an indie game with new features. The Story: Let’s see how that happened. When we launched as a ‘Must Have Game’ back in February 2012 on Windows Phone, we were already hard at work to add some new features that were just being added to the Xbox LIVE platform for Windows Phone games, such as Avatar Awards, Asynchronous Multiplayer and In-App Purchases. At that moment, IAP was not natively supported by the Windows Phone platform, so we used a framework developed by Microsoft specifically for Xbox LIVE games, and paying for these was done with Microsoft Points, a virtual currency used in the Xbox ecosystem. Meanwhile, Xbox LIVE decided to drop the concept of mspoints and convert everything to real money. This went into effect gradually in different parts of the world, but finally when it was completed, the surprise came: in a number of Windows Phone titles that have used mspoints for In-App Purchases, this system stopped working. So when you would try to purchase anything, you’d be greeted by a ‘Transaction failed’ message. These games were pulled from the marketplace soon after, and the games are no longer downloadable. The Sadness: Normally, this could easily be fixed with an update that removed the IAPs, or converts the game to use the native IAP support which is available since Windows Phone 8. But in this case, the option to do the update was out of our hands, since we are not the direct publisher, Microsoft Studios is. And for the limited number of games that were affected, the official decision was to no longer support them, but allow the developers to re-release the games as we see fit. 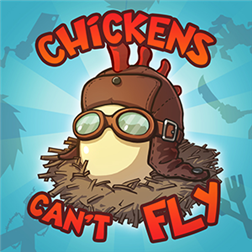 The timing of this was not ideal since we just launched the game on iOS and Android, and now Windows Phone (which was our first platform) was the only major mobile platform that did NOT have Chickens Can’t Fly. Good news though is that it is back and available now! Earn 20 achievements and show the world you’re the best Chicken in the leaderboards! The Chicken Skins and Dojo Laboratory are now available for everyone to play! Written by: Hyde13 on October 23, 2013.